A little brief history on the region before we jump straight into all the beauty we witnessed while in Bagan! Bagan used to be the capital of the First Burmese Empire in 874 with most of its buildings erected in 1000-1200 AD. Throughout the long history of this place, rulers have repeatedly changed. Later on, the monks made Bagan the religious and cultural center of the state, declaring Buddhism the state religion. In the 12th and 13th centuries, the city became a truly cosmopolitan center of Buddhist beliefs, attracting monks and students from India, Sri Lanka, as well as from the Thai and Khmer kingdoms. By 1287, the kingdom had been captured by the Mongols, after refusing to pay tribute to Han Kublai. Abandoned by the Burmese king and later by the Mongols, the city ceased to function as a political center, but continued to flourish as a place of Buddhist faith and science. Currently, the ruins and functioning temples of Bagan cover an area of 16 square miles. 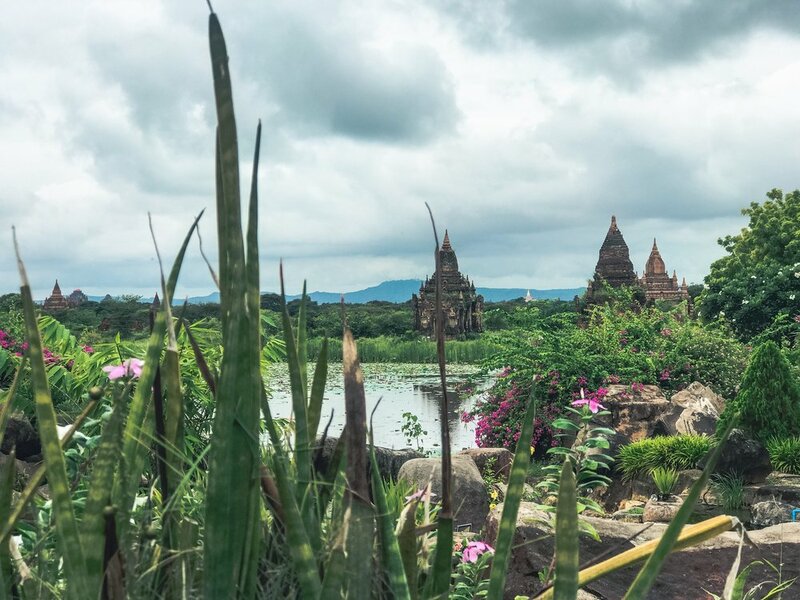 This ancient city is one of the richest archaeological sites in Southeast Asia with approximately 2,230 monuments still preserved. Bagan was on the list for inclusion to the UNESCO World Heritage List, but was later excluded. This place can no longer be defined as a world heritage site, and this is at fault of the former authorities – the military junta of Burma. They restored ancient temples and buildings, ignoring the original architectural styles and using modern materials that have no resemblance to the original designs. The junta went even further by installing a 200-foot fire tower near Bagan, as well as building a highway and a large golf course. Nyaung U (Nyaung Oo): there are almost no temples (although the famous Shwezigon is located just at the entrance to Nyaung U), you can find hotels and guesthouses for every taste and budget, rent an electric bike, and find affordable eats. The airport and the bus station of Bagan are located near Nyaung U. Old Bagan - on the map this part of the city is located inside the fortress wall. Old Bagan is part of the more extensive archaeological zone of Bagan and is located in its very center. If you wish to and have financial opportunities, you can live inside the fortress wall - but it will cost several times more expensive than housing somewhere in Nyaung U. New Bagan - located on the banks of the Irrawaddy River south of Old Bagan. There is less temples, but more restaurants and cafes. We stayed in New Bagan and found it to be a convenient place to stay in terms of price/quality ratio. As of October 2018, the Myanmar Tourism Federation collect the K25,000 entrance fee from tourists at Bagan which used to be valid for 5 days, but now it’s written on the ticket that it’s only good for 3 days. Anyway, we stayed in Bagan for over 3 days and no one checked our tickets at the exit. We visited Bagan during low season, so didn’t have our tickets checked in any of the temples, but normally people say that you have to carry them with you all the time, as they might get checked in some of the major sightseeing spots. When you arrive to the bus station in Nyaung U, the taxi drivers will try to scam into paying almost double the price it should cost you, so beware of that. Right at the bus station there are posters with the fixed prices to different destinations written on them. We stayed in New Bagan and the fixed price to get there was 8000 Kyat, while the price they offered us was 15.000. Pair up with other travellers, walk around and negotiate, just do whatever to avoid getting hustled. It helps to know how far it is to your destination in terms of time and distance, use this and past prices paid in Myanmar to help you negotiate. *If you don’t already have maps.me downloaded on your phone, we highly suggest you do so. Maps.me is an offline map that’ll show you the land you’re on whether or not you have service, and it will show you all points of interest. The best way to get around is to rent an e-bike. We paid 5000 Kyat for a full day for two people to be on one bike, if you rent only for 1 person the price is 4000. If you are only renting one for half a day, make sure to add this factor in when negotiating on the price, as we did with one of the places and they let us take the bike for 2000. *Not sure if it was just because we were visiting during low season, but they didn’t ask us for ID or passports. We happened to stumble upon this village when we were driving a scooter in the area and accidentally ran into a local tour guide who offered to show us around (which we guessed would be for a compensation of course, Jim tipped the tour guide 10.000 and she was more than pleased). Here villagers process crops, feed animals, make cigars, clothes, and handcrafts as souvenirs. Residents in Minnanthu Village will invite you into their houses and offer you tea and food, which is a part of the tour. The tour guide will introduce local traditions such as: living habits, stories about the village/villagers, and also characteristics of the countryside houses. You will get an insight into village life in Bagan which is, however, brushed up for tourists. There are a couple of shops such as lacquerware, silversmith, sand paintings and handmade longyi, with all of them being pretty pricy. So be prepared for people to try to sell you something. Note: Compared to the rest of Southeast Asia the people in Myanmar are not as pushy as to make you feel forced or uncomfortable buying something from them. Minnanthu Village is not a big place, but very cozy, clean, and surrounded by lots and lots of temples. Overall the village is worth a look around even though it is obviously a place designed to attract tourist. Built in 2005 as a viewing platform at the bottom of which lies the 5 star resort “Aureum Palace”, it is amongst all the ancient temples which gives you a panoramic view and honestly one of the best views in all of Bagan! You pay $5 USD, take the elevator up to the 11th floor and then follows the stairs to 13th floor to reach the observatory deck which is open-air, during high season they also offer a sunset happy hour at the bar on the observation deck. As we stayed at Aureum Palace, the entrance for us was free! It may be a nice alternative for a hot air balloon, because you can stay as long as you want and you have no weather restrictions. And it's way less expensive, while still managing to get a fantastic view. If you’re looking for a romantic evening, they’ve also got a fantastic restaurant on the 11th floor. Every Thursday night they have a live acoustic evening from 5-7 p.m. with all the food and beverages being half the price of the resort it is directly above. Going in low season made this night super romantic as he was singing only love songs and we had the restaurant to ourselves! Note: If you’re staying at the “Aureum Palace” you do not have to pay to go up, you simply just ask for tickets at reception and you can go up whenever you’d like. 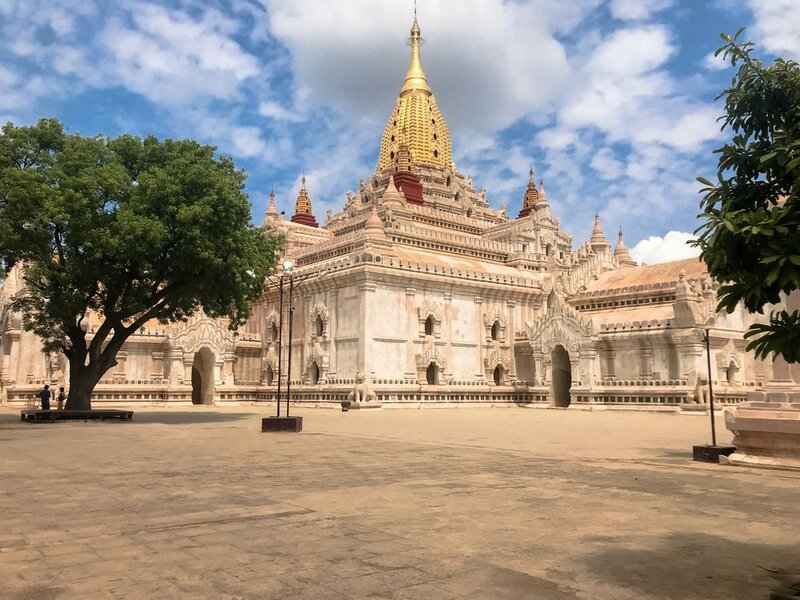 As of 2018 climbing temples in Bagan has been banned for the sake of their preservation, due to the recent earthquakes and for tourists’ safety. Another unofficial reason that the country wishes to get Bagan recognised as a UNESCO World Heritage Site. Temple at 21.145909,94.883118 The stairs are on the outside of the temple and it’s easily accessible. It’s not very high but gives a great view. Temple at 21.156784, 94.867959 It is marked as ‘Sunrise temple’ on google maps or maps.me. Myauk Guni at 21.1552352,94.867528,15.25 Tucked away in one of the corner pillars, you will find a narrow, winding passageway to North Guni's seventh floor terrace. Bulethi at 21.1738474,94.8796892,17 The narrow terrace circles the body completely, allowing 360-degree views of the Bagan countryside. Our go-to spot while we were staying in New Bagan. 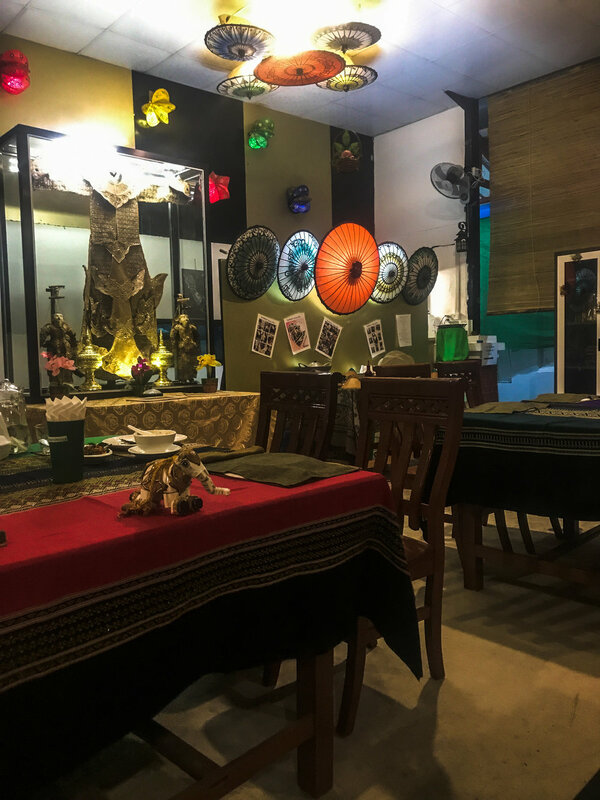 Mimosa had a wonderful selection of authentic Myanmar cuisines including tea leaf salad, fried noodles, and also meal sets based upon your preferences (vegetarian, western, Chinese, Thai, or Indian). We found it to be one of the best prices to quality places in all Bagan to be honest and would recommend this to anyone traveling here on a budget. We visited here at a weird point of the day, about 2 pm. So we were the only people eating at the restaurant at this time. However, the service was very good as was the quality of the food. We were told most nights during high season they have local music on the dragon stage over dinner. Overall we enjoyed Welcome Restaurant very much with its cosy atmosphere and dimly lit dining room, it makes for a romantic evening. This place was a little bit off the beaten path, we kind of stumbled in the wrong direction and found this gem of a restaurant. Zarchi Ain has by far the best and most attentive staff we encountered in all of Bagan. With a very knowledgeable and English speaking staff, we were immediately impressed. The portions here are easily shareable and will definitely not break the bank. By far one of the most life changing places in Old Bagan (well if you ask Jim). It was the only place we found while travelling around from Pagoda to Pagoda that actually makes a decent cup of coffee in the area. Most of the places you find are using the instant packets that mostly everyone in the area uses. However, Good Time uses locally sourced fair trade beans which compared to other Southeast Asian countries is fairly good. One of the most different type of rooms we’ve ever stayed in for sure. We booked this place due to it being the lowest price on booking.com for a low price of $16/nt. This hotels interior was a bit outdated and we were shoved down a hallway which leads outside to an alley with one room in the back, however the breakfast buffet and swimming pool accommodate for the things lacking in our claustrophobic room. Book Here! Words cannot begin to describe how beautiful and romantic this place is nestled perfectly between pagodas and on a beautiful nature filled lakeside. We spent the two days after we got engaged here and nothing could have been more to our liking than the royal treatment we received from this property. Book Here! The breakfast buffet was filled with eastern and western cuisines that couldn’t be compared to any other place in Bagan. With a bed built for a king and his queen, a hot tub in your bathroom and a shower made out of stone…what more could we have asked for? Besides a balcony in the back for us to sit out and listen to all the life happening around us on the lake and a beautiful views of the pagodas across the water. Interested in seeing more about our time in Myanmar? Check out our 10+ days in Nyaung Shwe and Inle Lake here!